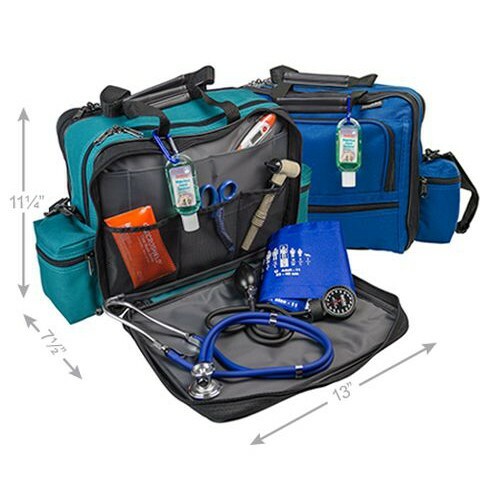 Mark V Nurse Bag, manufactured by Hopkins Medical Products, is a superlative choice for traveling clinicians and medical professionals, especially ones seeking convenience and durability. 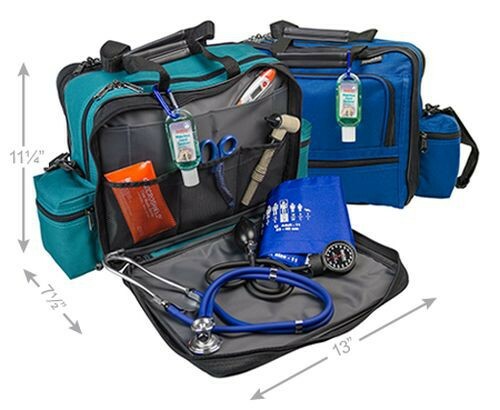 Featuring a fold-down compartment to create a clean workspace, "clean" and "soiled" pouches, file folder, and more, this medical tote is an excellent option when transporting equipment from patient to patient. Depending upon your needs while traveling, you can use the double grip handles or adjustable shoulder strap to safely transport information, supplies, and equipment. There is no other bag that will offer you this kind of functionality at this price. Order now and enhance your traveling practice today! End pouches for a cell phone or pager. Separate sections for "clean" and "dirty" supplies or equipment. Product Numbers: 530655 and 530680. Nursing Bag Length: 13 inches. Nursing Bag Depth: 7-1/2 inches. Nursing Bag Height: 11-1/4 inches.